I decided to keep Lent this year. I pulled my calf muscles some days ago. I did nothing more than picking up a friend from the railway station hurrying too quickly so as not to be late. It was all in vain because the train was late. So here I am, I can't go running at the moment. I pondered my situation and because Ash Wednesday was approaching I concluded that if I can't work out it might be a good idea to restrict my eating a bit to make up for the lack of excercise. And what better time to choose than Lent! It always helps to know that you are not the only one who tries even if you don't know who else in your vicinity is keeping Lent. And so far I don't. I actually wanted to start making gloves but, erm, I seem to have diverted my attentions to something I don't need at the moment. I would need gloves. I got this pink Schachenmayr wool very cheaply and because I alway wanted to make the Quick Work with Thick Wool jumper in Susan Crawford's A Stitch in Time Vol. 2. I started it yesterday. It is really quick work. Almost half way with the body just about finished. I knit this in the round, because I like the wrong side too with its raised purl stitch columns. Just published another pattern. The Overfall Beanie complementing the Overfall jumper. I liked the Overfall jumper so much I wanted to make a hat to go with it. Of course it can be worn without the jumper. Klick on the picture above to go to the pattern in the Shop. I hope you like it. My grey angora gloves are finished. They have turned out too big after the first wash, but I'm certainly not opening them up again. I will insert a few rounds in the fingers, give them to my son and make another pair. Yesterday I was looking for some wool for the next pair when a UFO fell into my hands: Bavarian style socks. They are really only Bavarian style, not proper traditional Bavarian socks because I knitted them from the toe up - the real thing is top down - and therefore the patterns are also in the 'wrong' place, so to say, and I'm not Bavarian. I absolutely love twisted stitch cables. I have at least six books with Bavarian and Austrian twisted stitch patterns. I am resolved to finish the socks today. One UFO down - hopefully. My possume chemise is finished. For the straps I used i-cord. I have no idea what you call the edging I used to run the i-cord through. In German it's called Mäusezähnchen - little mice teeth. The bottom border ist just garter stitch. It's still a bit to warm outside to wear it but the time will come. And because recycling is so nice I started the next project: recycled angora gloves. I have a pair of angora gloves made by my mum. They are the warmest gloves I've ever had. Unfortunately they are now a bit dirty and tatty. Seeing them slowly disintegrate made me very sad and and therefore it's time to make a new pair. After working all weekend on them I've just got the thumbs and the tips of the fingers left to do. I'm not quite sure yet how I want to do the tips. Talking about underwear I looked though my vintage patterns a bit to see what I can find. I like above from Stitchcraft November 1936 because it looks cosy and the lace stitch goes well with the cut. I think I might have a go at this myself. Here a more robust design in Stitchcraft January 1936. It does say ‘a set for people who feel the cold’, but for those who are more cold-resistant the instructions also give advice on how to make a lighter version with thinner yarn. I guess if you make the lighter version with thin cashmere or alpaca it will be as warm or even warmer than the heavier version with sheep wool. ‘Warm without Thickness’ was published in Stitchcraft February 1935. It’s a very dainty piece. I like the simple lace pattern and the little bow at the front. I put scans of all three patterns up for you to have a go at if you like. Just click on the pictures or go via the Free Vintage Patterns gallery. I started a little recycle project making Enchanted Mesa by Stephen West. It is a very good project to get rid of the odd balls of yarn in the stash. The construction itself is inspired, though West’s colour scheme is certainly not my thing. But then nobody is forced to emulate somebody else’s taste. I accidentally chose something close to the colour combination of my bedlinen. I swear I was in another room when I pulled the colours from my stash. It’s coming along very nicely despite the fact that I managed to get the decreases wrong on the red kidsilk section, which of course was really annoying to open up. Now it’s mainly brainless stocking stitch with an alpaca yarn from a frogged jumper bought in a charity shop. The other yarns are left over alpaca (dark pink), alpaca silk (pink), Austermann kidsilk (red) and Rowan mohair haze (orange). I chose a provisional crochet cast-on for the underarm stitches instead of the cable cast-on because I think it’s a bit neater. I also started the body section at the left arm and not at the right shoulder. Let’s see how far I will get over the weekend. I also put it up as Ravelry project. Once upon a time my boss Mary Griffin, may she rest in peace, gave me two metres of a very nice cotton fabric with a poppy motif. I always wanted to make a skirt from it and never got round to it. A couple of weeks ago, while thinking of Mary again, I remembered the fabric in the chest. Needless to say what you can see is the result of me finally making a summer skirt from the fabric. Mary was a keen knitter herself. 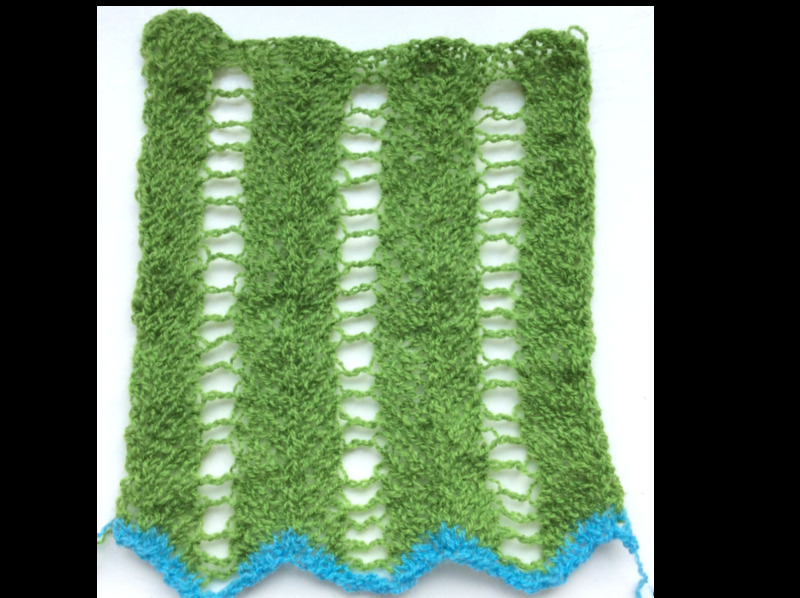 She once told me she had published a knitting pattern in New Scientist featuring a random cable knitting pattern, but she said she couldn't remember anymore when it had been published and it probably had been long forgotten and destroyed. She was usually right about things but not this time. I was able to find the original publication of her pattern online: Mary Griffin, Wear your own theory. Mary Griffin with a beginner's guide to random knitting', New Scientist, 26 March 1987, pp 69 and 70. Plonk her name and 'knitting pattern' into Google and it will surely come up in Google books. Someone had picked up on it: Josie Mercier had designed a children's random cable jumper based on her pattern which was published in Knitty in 2005 and a few others discussed it on their blog or Ravelry group. There Mary, not forgotten! Neither are you! My plan to move further to finalising the Bach pattern for publication at the weekend was pleasantly disrupted by a heavy need to chill out on Saturday and a fantastic surprise visit on Sunday of very lovely friends my son and I hadn’t seen for years. In the meantime, until I get my shop finally started, I thought I would share a vintage pattern. It’s a children’s jumper in three sizes knitted in what looks like quite a simple check pattern. I haven’t knitted it myself, but I find it very cute and I think it would look good on girls and boys alike. It’s one of a few children’s patterns I have, so watch this space if you like children’s patterns. Click on the picture to download the pattern.